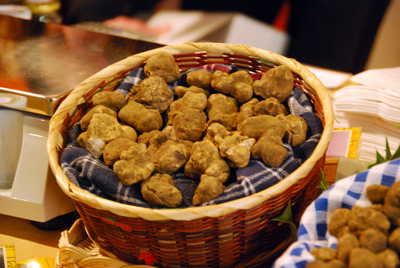 You might be thinking...isn't five days enough time to spend at a truffle festival? 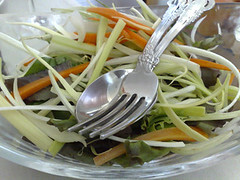 Well, no, it isn't. 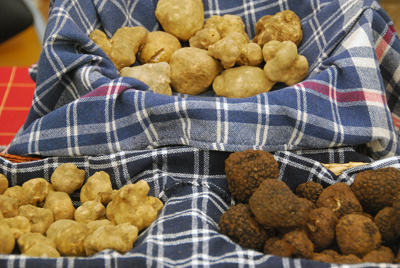 You can never spend enough time with truffles. 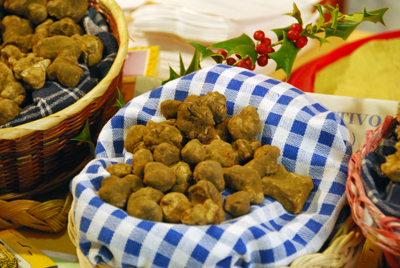 Today Paalo and I head off to a small hilltop town called San Miniato for the start of the their 3 weekend Truffle Festival - XXXVII Mostra Mercato Nazionale del Tartufo Bianco di San Miniato. 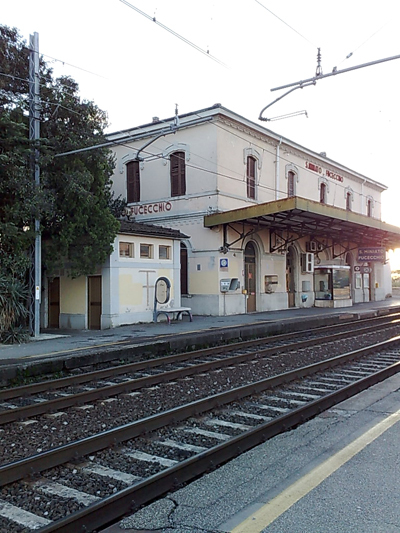 The train is on the Pisa line and from Florence SMN station you will get there in about 40 minutes if you select the right train. 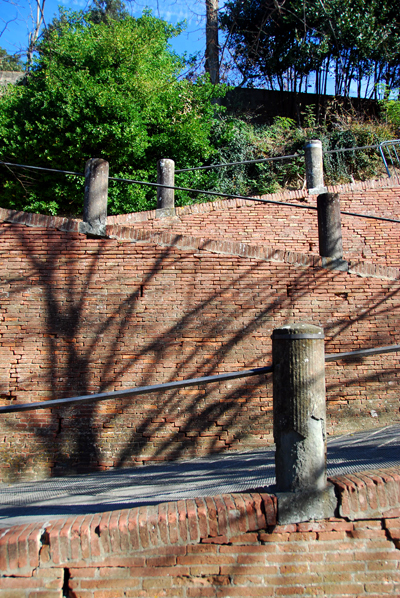 Once in San Miniato things are a little less clear. 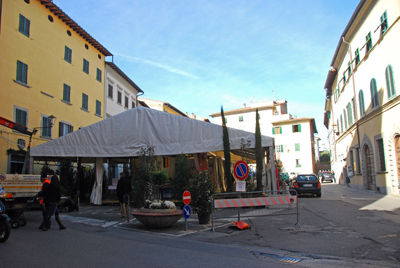 From what I could gather from the signs, the bus route has been shortened and stops suspended and will only take you as far as Piazza Dante Alighieri. 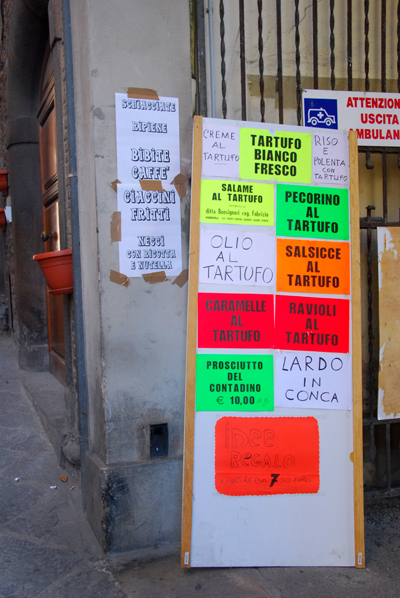 You can buy bus tickets from the Tobacconist opposite the train station if the shopkeeper ever gets off the phone. 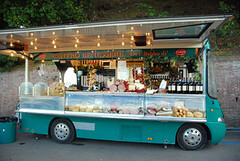 The bus you need to take leaves from in front of the train station and you can buy tickets on board - they will cost €1.50 each way. 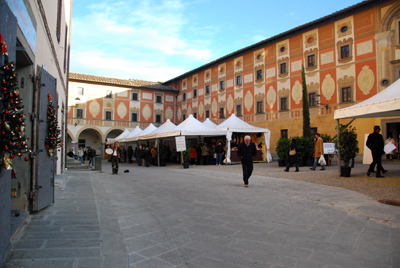 Piazza Dante Alighieri on Saturday is the site of an arts and craft market and to get to the festival you'll have to go up the road, the Corso Garabaldi. 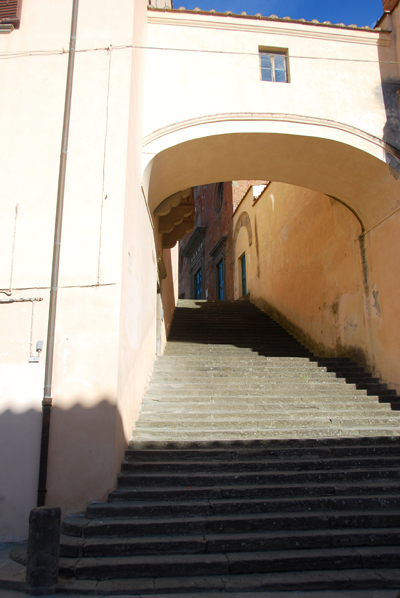 The first stop was the Piazza del Poppoli where we found two information offices and maps of the town as well as information about the festival and the programme of events. 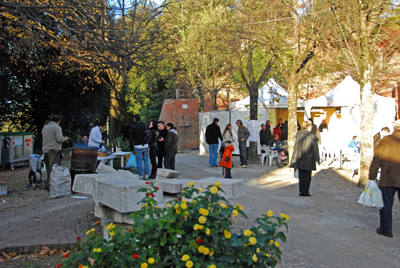 The programme shows us the various sites set out around the city and associated themes. 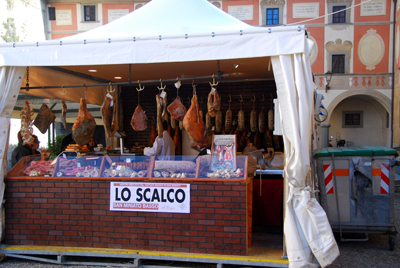 The stalls set up on the Piazza del Popolo are designated for the Slow Food Presidium and products from San Miniato's sister cities. 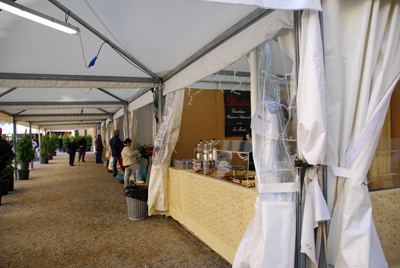 The stalls here are still being set up - it is the first day after all! 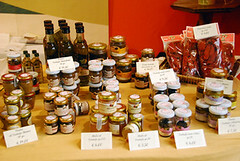 Here we found things like honey, wine, oil, milk, cheese and baked items. 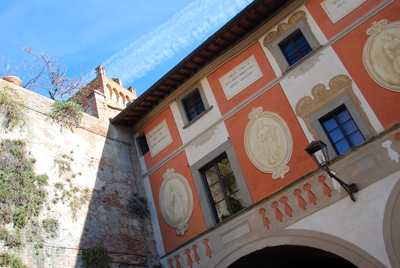 Using the map, we continued past here towards Palazzo Grifoni. 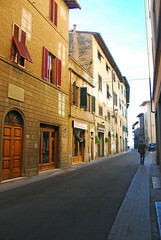 You may think by looking at the photos that the streets looked quite empty and peaceful but it was anything but that. 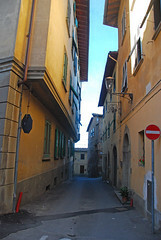 The traffic was quite chaotic as these narrow streets are two way! 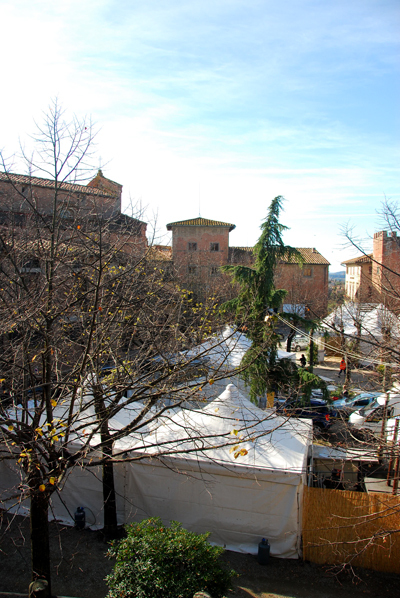 People trying to carry on their normal Saturday morning routine competing with the added festival traffic. 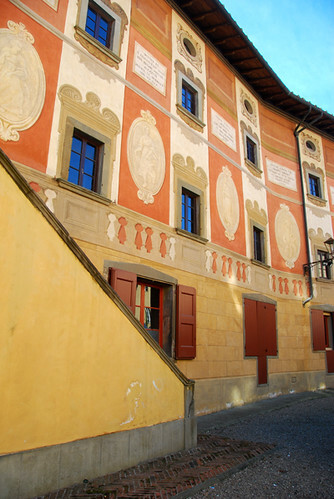 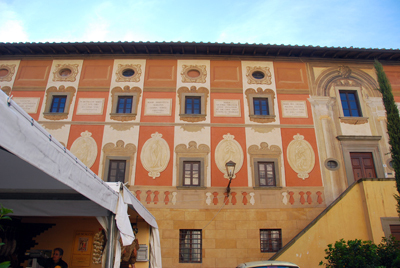 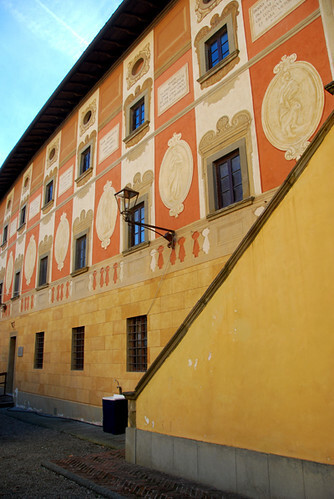 This is the Palazzo Grifoni built in the 16th Century by Giuliano di Baccio d'Agnolo for Ugolino Grifoni. 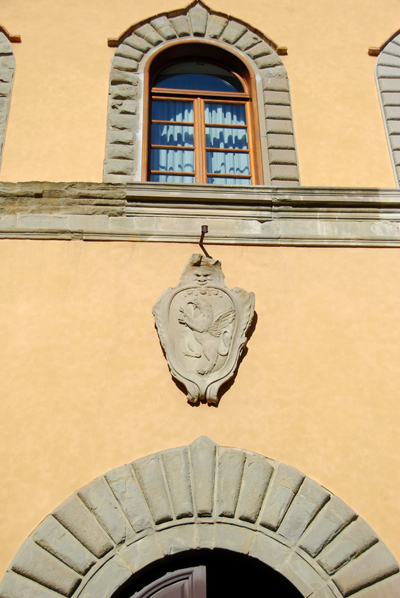 Grifoni means Griffin which is obvious when you see the crest. 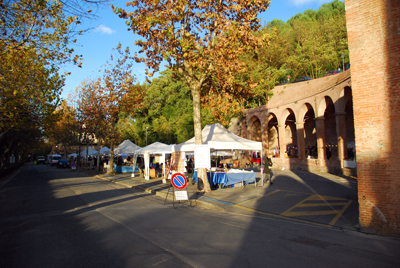 While nothing is on today here, according to the programme here you'll find flowers, plants and fruit on Sundays. 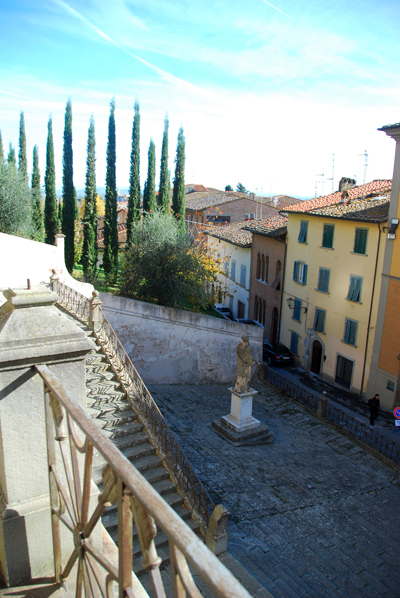 We turn back on ourselves here and head off to see the other marked areas. 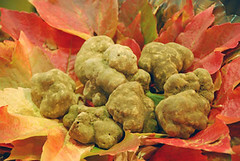 We get our first sniff of truffles here and a good view of the area too. 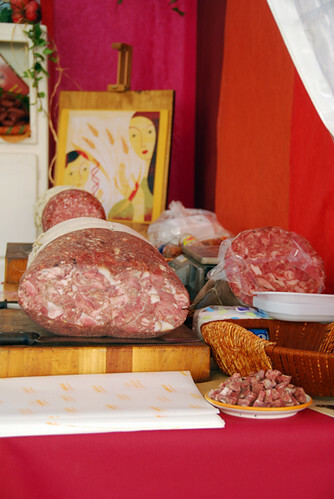 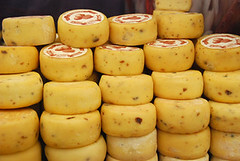 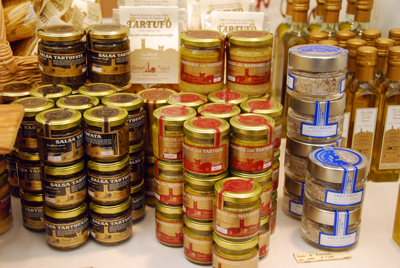 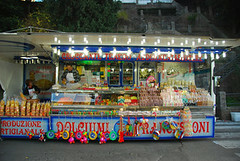 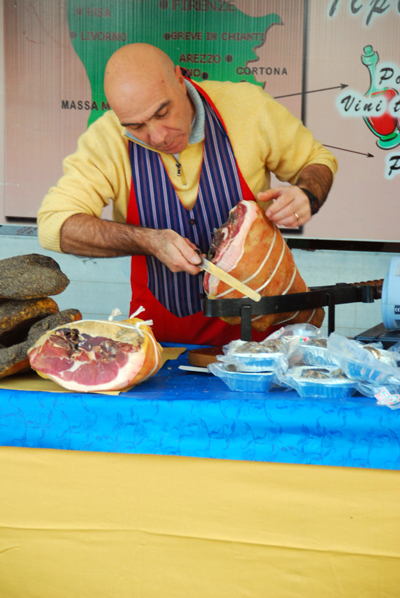 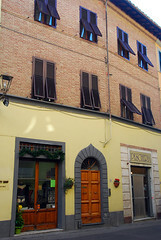 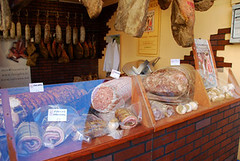 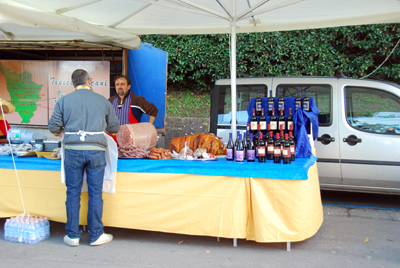 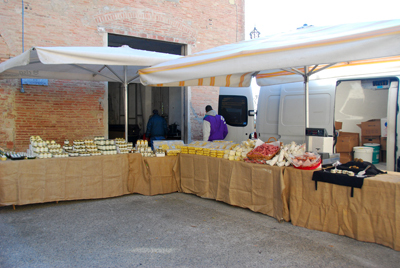 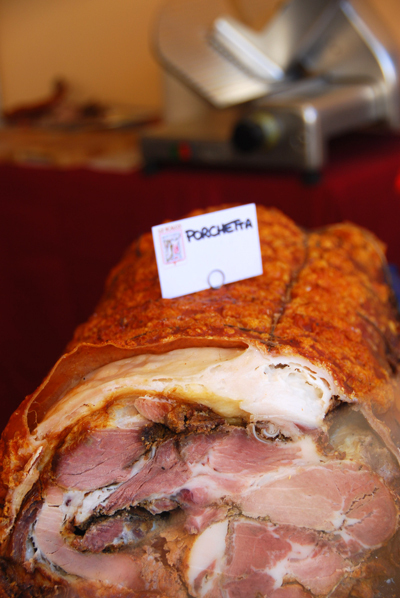 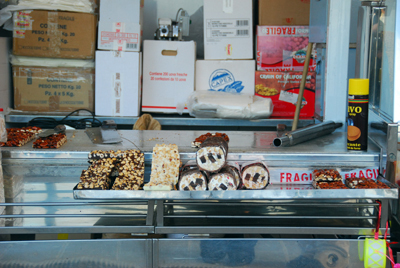 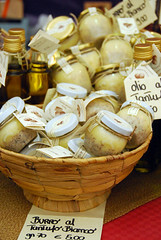 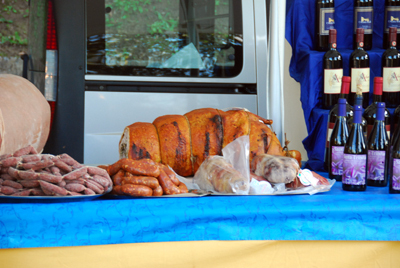 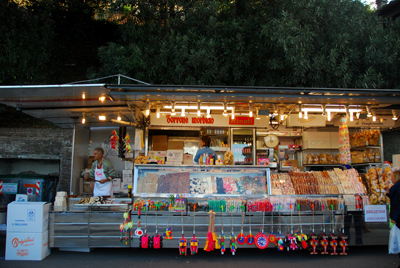 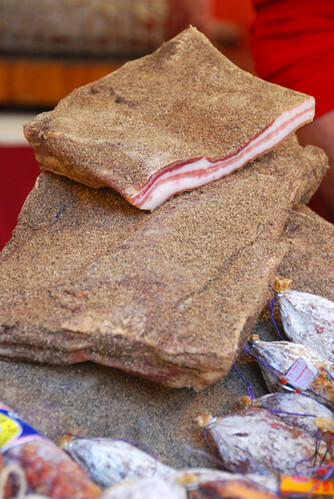 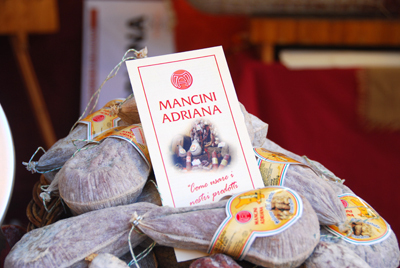 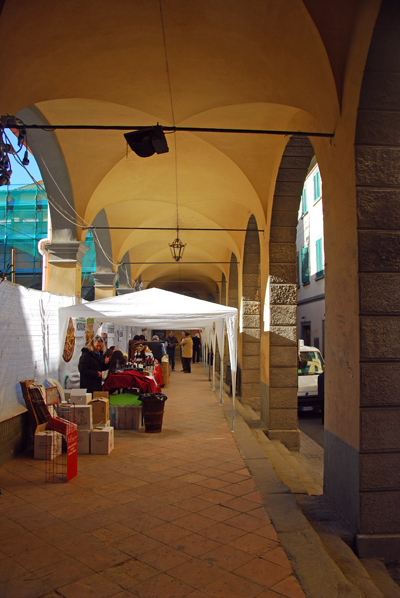 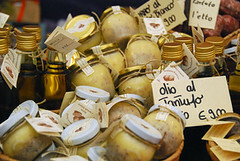 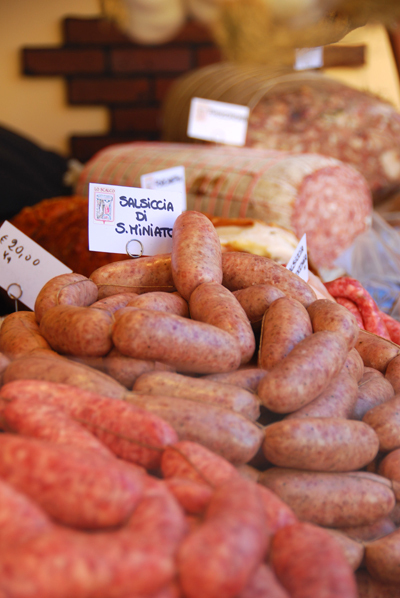 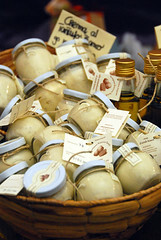 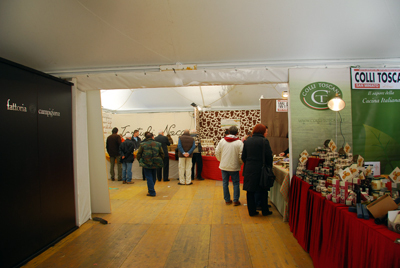 The stalls here offer oil, wine, meats, cured products, baked items as well as items incorporating truffles. 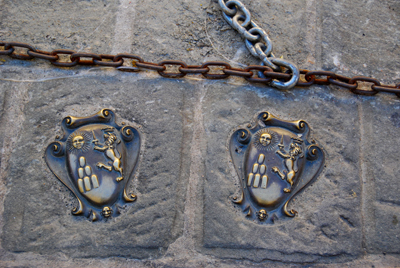 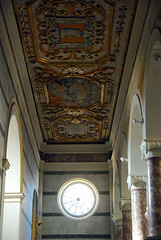 to reach the Piazza del Duomo. 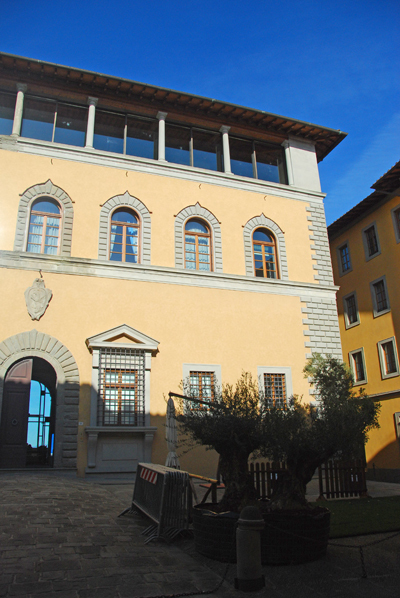 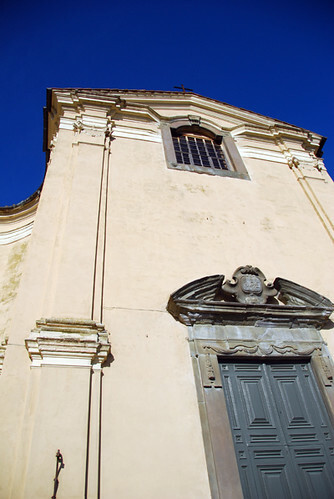 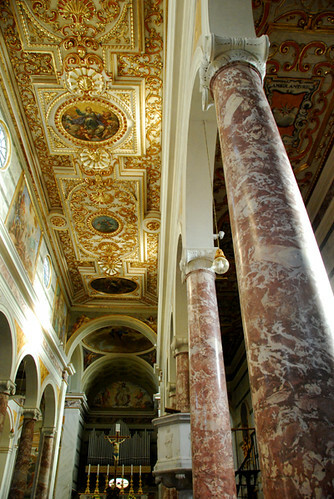 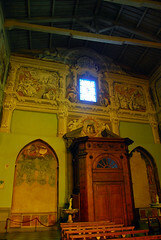 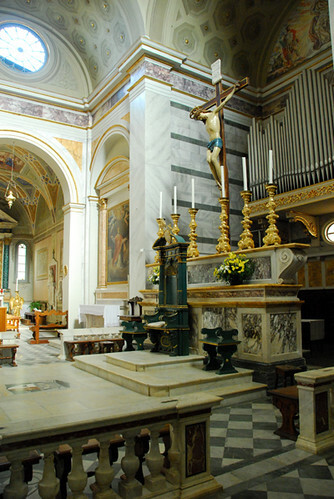 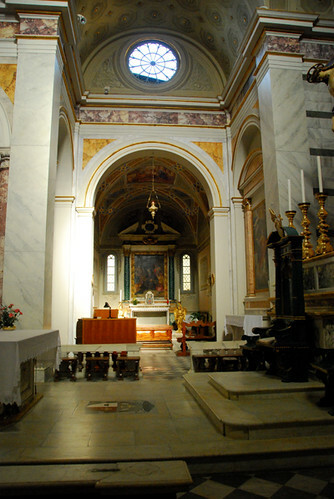 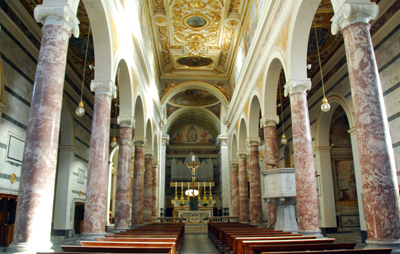 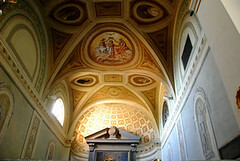 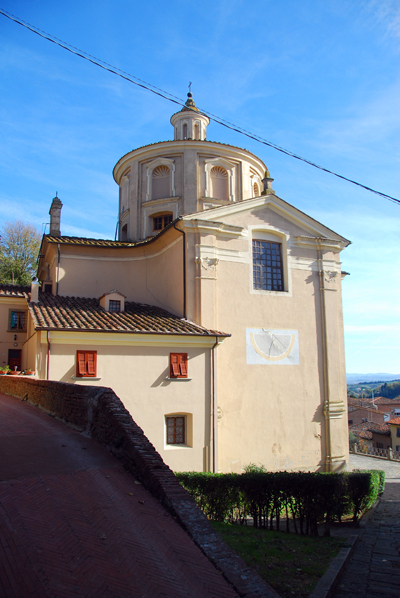 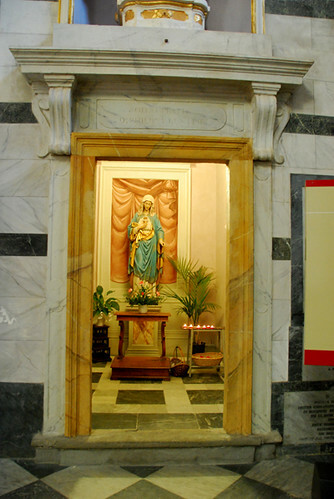 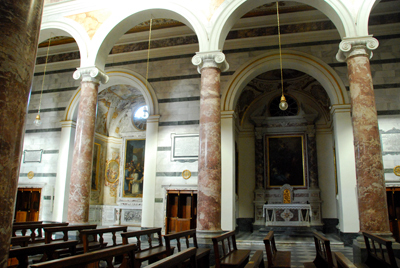 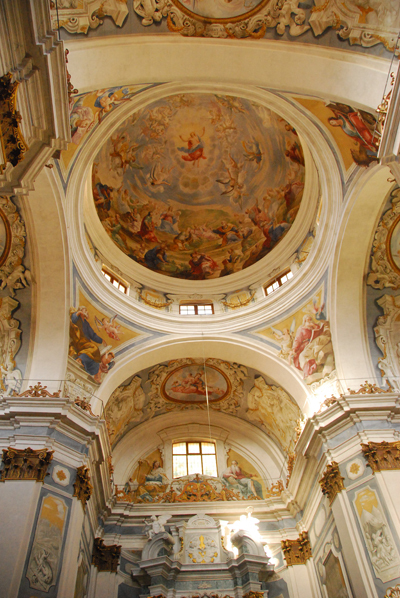 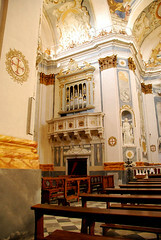 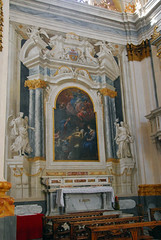 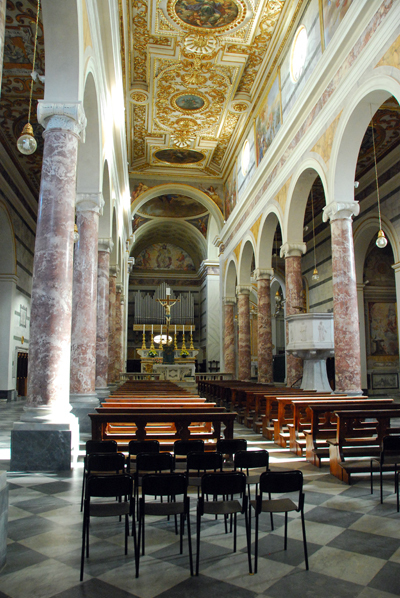 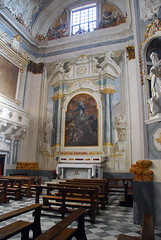 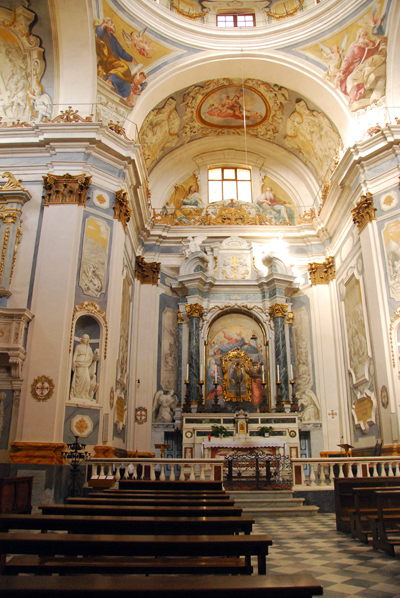 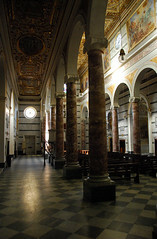 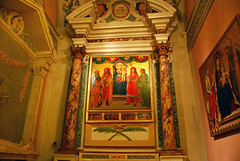 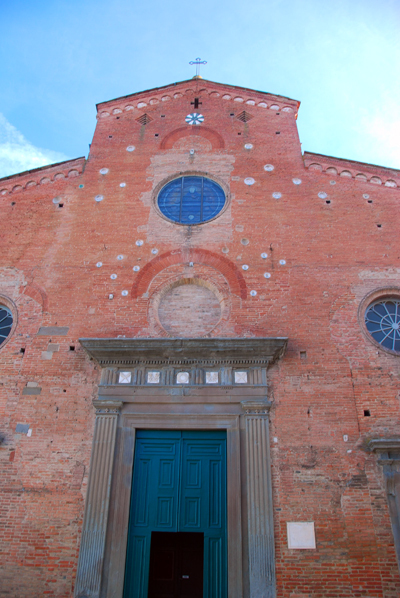 where you'll find the Duomo di Santa Maria Assunta e San Genesio. 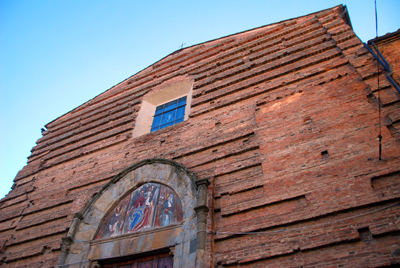 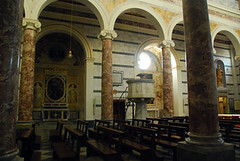 Dating from the 12th century it has been modified in the 15th and 16th centuries. 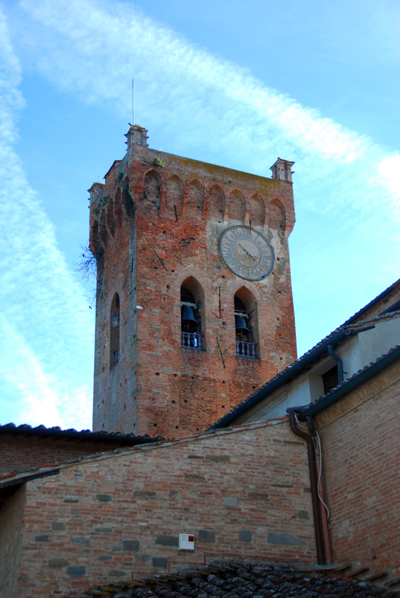 A castle tower was modified to form its campanile. 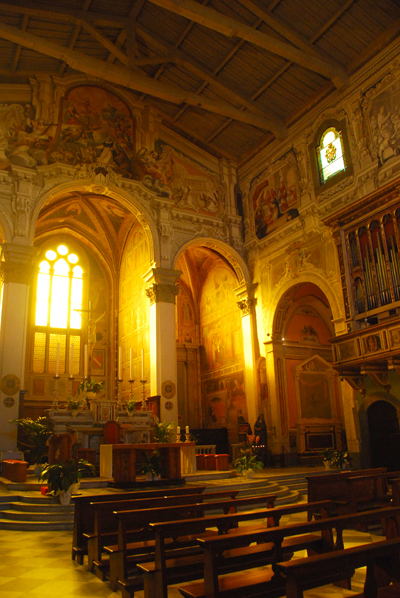 Inside it is quite splendid. 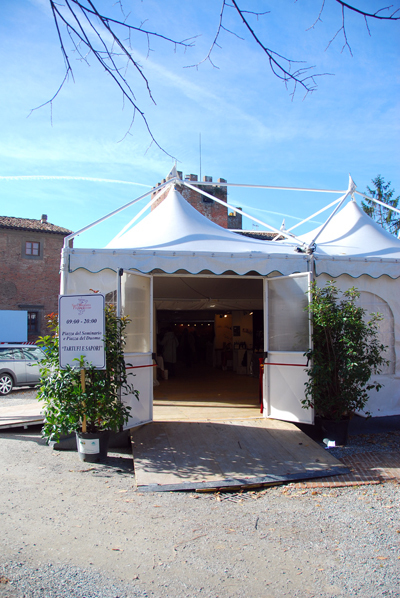 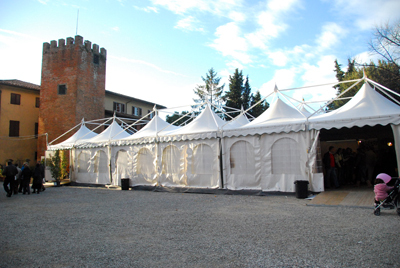 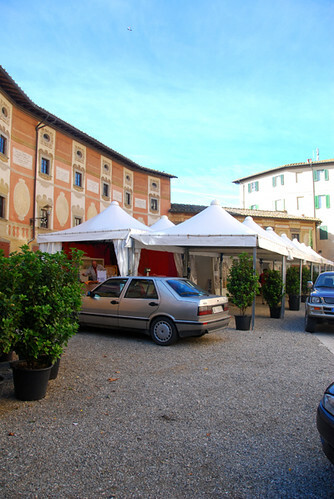 There are two festival areas here - one set of tents in front of the Duomo house truffle and truffle products as well as oil and wine and another set of tents is a dining area where various outdoor kitchens have been set up. 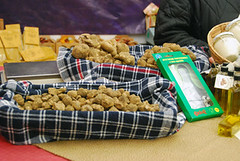 Almost immediately we notice that the white truffles especially are of a much better size than we experienced last week. 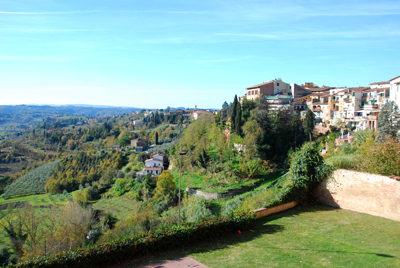 Obviously better weather conditions in Tuscany has helped. 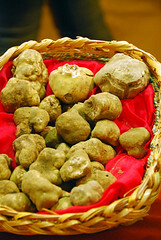 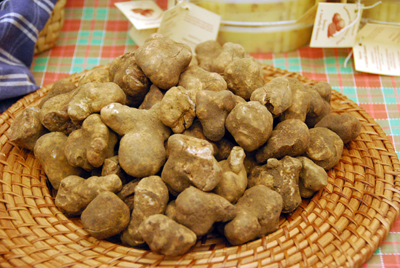 There are many more medium to large sized white truffles on offer. 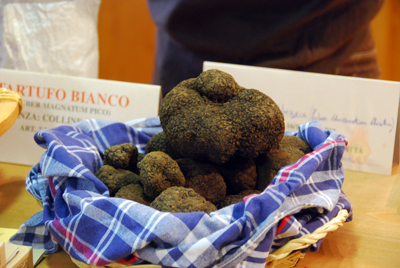 That has to be one of the largest black truffle we've ever seen! 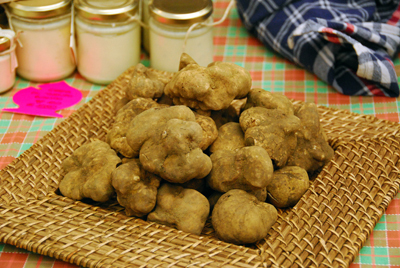 The hand gives you a better idea on the size of these large white truffles. 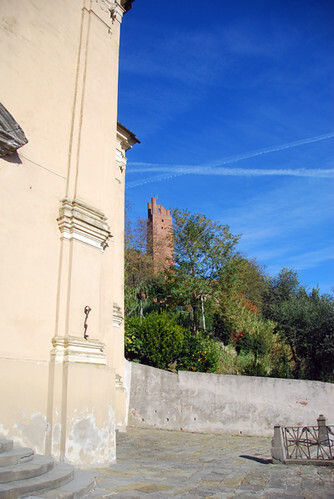 The tower you see in the background was originally built by Federico II in the 13th century. 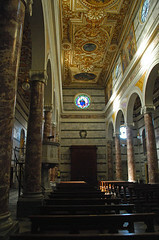 It was destroyed during WWII but subsequently rebuilt. 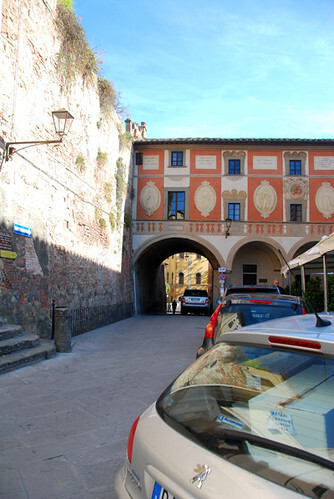 With 1pm approaching and the food stalls not yet operating we decide to stop for lunch at one of the town's restaurants - we chose to dine at Pepenero. 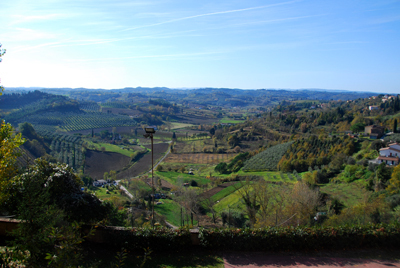 This is quite a funky restaurant with gorgeous views over the valley. 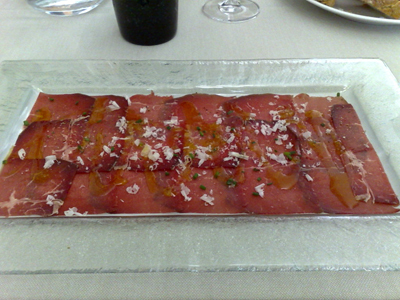 My Choice: Carpaccio di Angus argentino marinato alle erbe fini (Carpaccio of Argentine Angus marinated in fine herbs) - Excellent beef served as thin rectangles, it almost dissolves in the mouth. 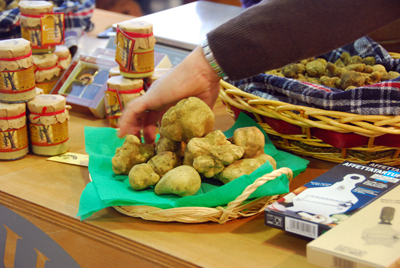 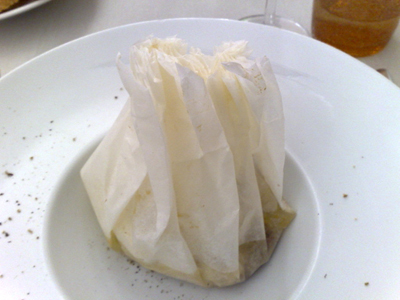 Such a simple idea but wow what impact - when you open the package you are immediately hit with that wonderful aroma of white truffle. 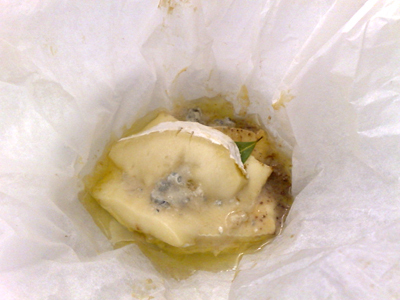 There's a blend of cheese used including a little gorgonzola. 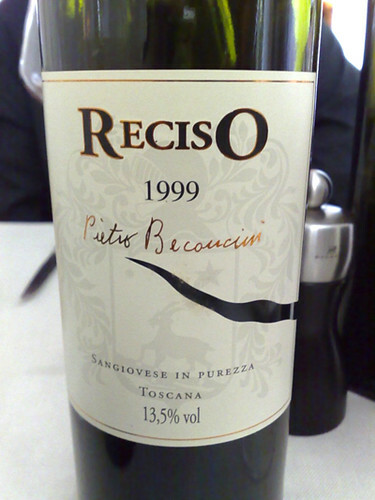 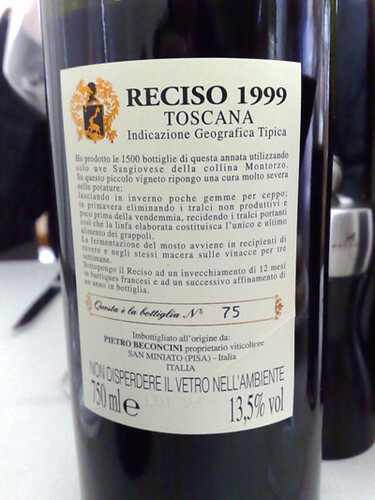 We started with two glasses of Prosecco but also order a bottle of Pietro Beconcini Reciso 1999 - a straight Sangiovese from the San Miniato region. 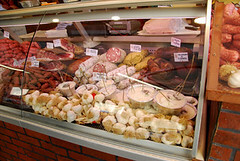 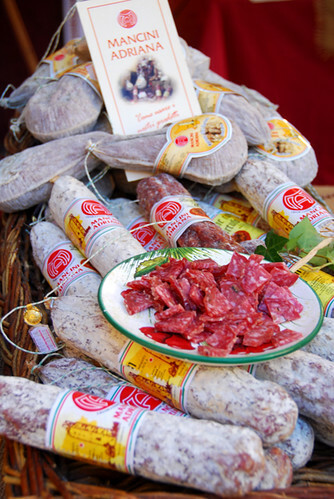 Having had cinta sinese sausages in florence, I was really interested in tasting the pure meat. 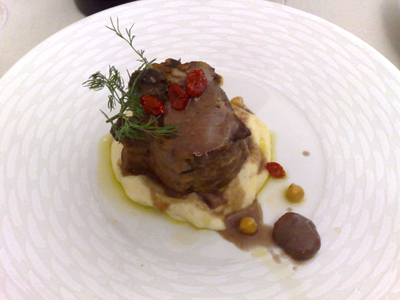 This was pork but with such a unique and amazing taste. 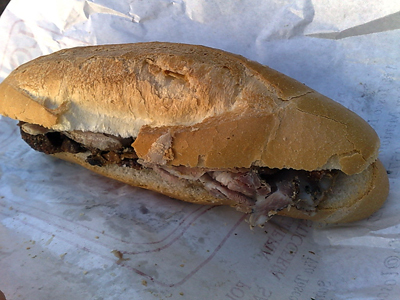 It was a fairly dense cylinder of meat but it was still moist and tender. 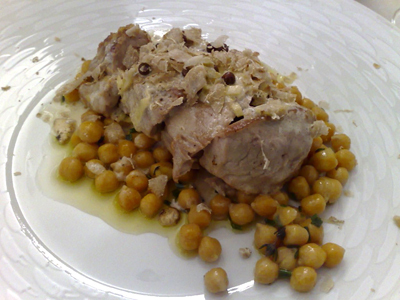 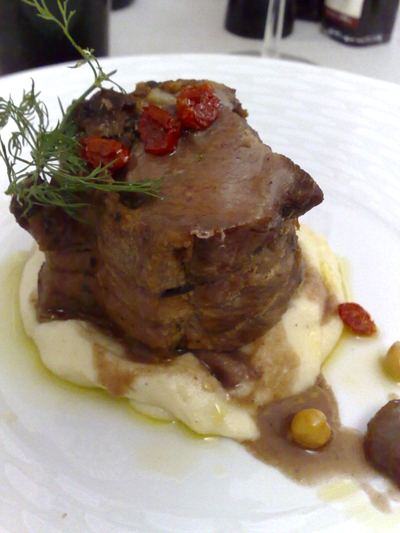 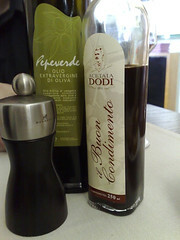 Yes, Paalo had the truffle double and he even enjoyed those chickpeas which is saying alot! 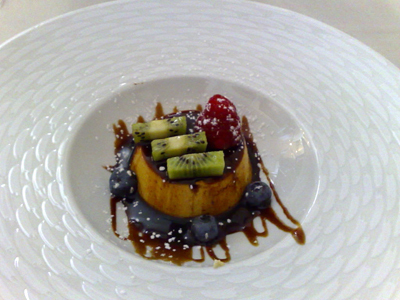 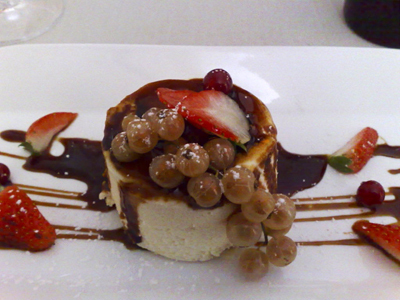 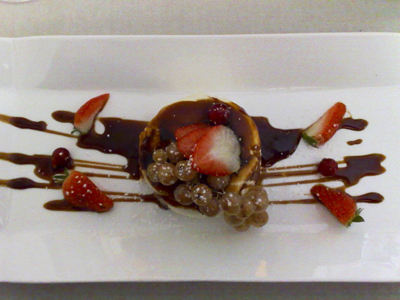 The ricotta torta was light and fluffy and the caramel sauce provided a good foil to the slightly tart currants. 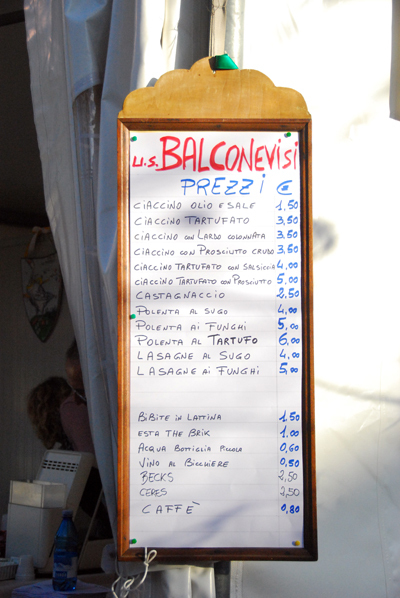 We must say that this was one of the stand out meals of this trip and what a surprise to have experienced it here in this small hilltop town. 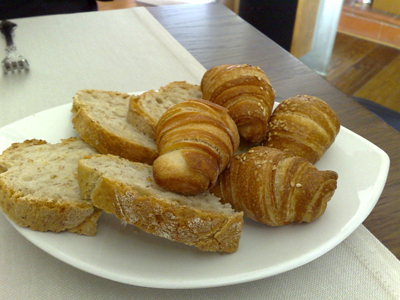 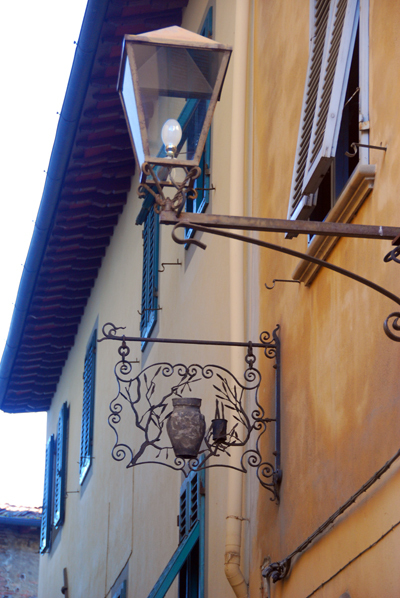 This would easily make it to our must visit restaurants and we're gladly just come to San Miniato to eat here. 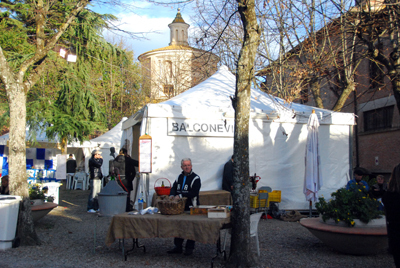 Well satisfied, we ventured around the festival for one final visit before heading back to Florence. 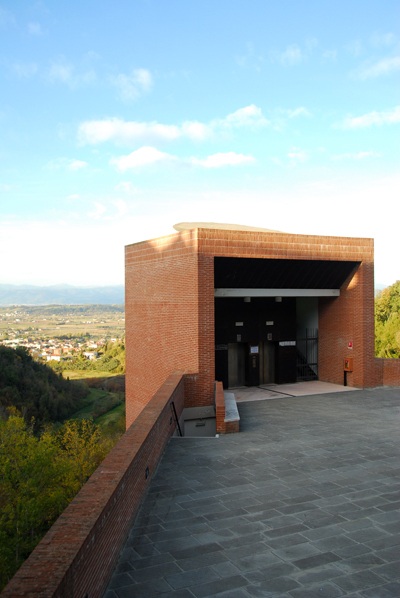 It is odd to see elevators out in the middle of nowhere but they are vital for getting people quickly from the lower level carparks to the top of the town. 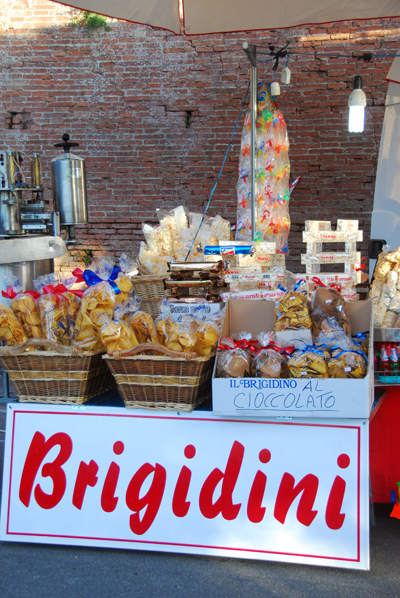 Our resolve finally cracks here with the Brigidini and we buy a packet of these fennel flavoured wafers. 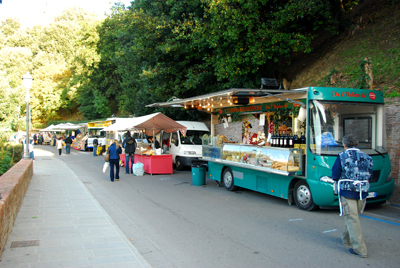 As we finally reach Piazza Dante Alighieri, the craft market is still on but we don't really look around as the bus to take us back to the station is waiting. 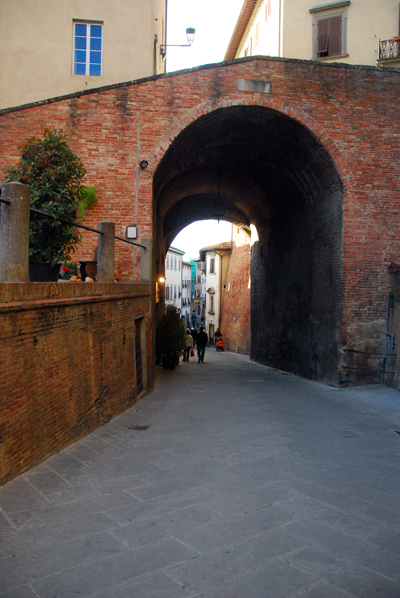 We've actually timed it quite well and it's less than a 10 minute wait for the train to take us back to Florence. 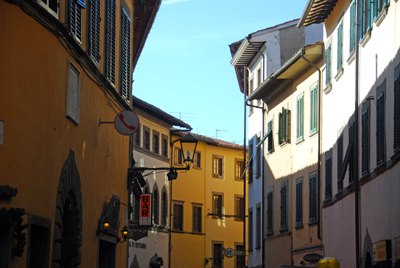 We arrive back tired but extremely happy - this was a trip well worth making. 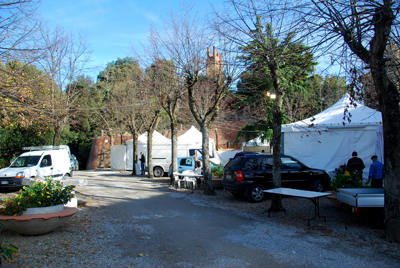 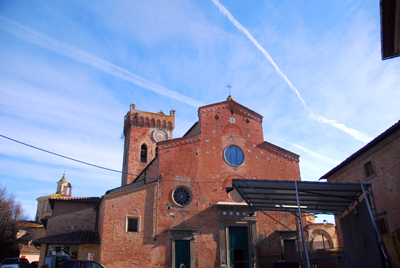 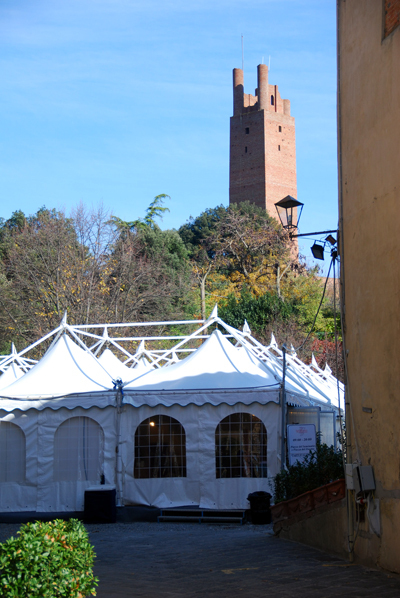 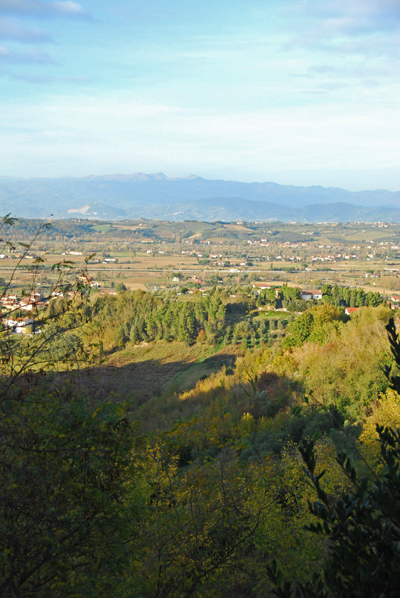 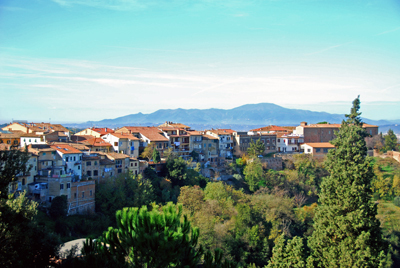 If you happen to be somewhere near Tuscany, the festival continues on the 17th/18th November and the 24th/25th November.